This game teaches kids about gravity and coordination, with help from a seesaw and silly friends. The secret to a super-fun seesaw experience? It's all in the balance. This wooden game teaches kids about gravity and coordination, with help from a gang of silly friends. Each player takes a turn rolling the die, choosing a wooden piece based on the color they roll. The trick is picking a size that won't send one end into the proverbial sandbox. 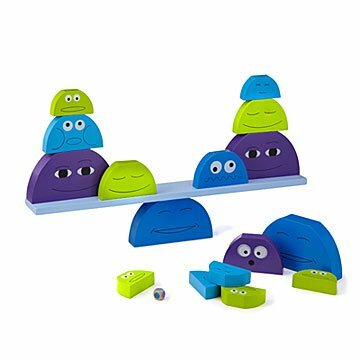 The set makes a challenging, cheerful gift for the little with big playtime goals. Designed in The Netherlands. Made in China. Love this well made toy. Takes some problem-solving skills to make it work. Plus balance is everything!